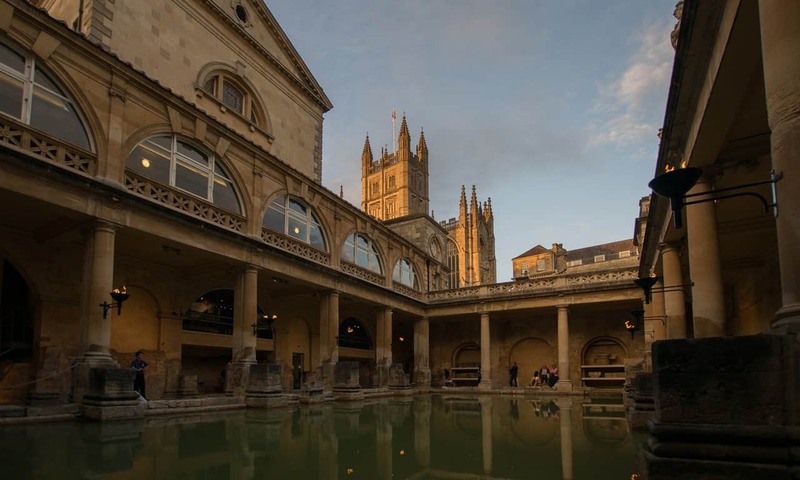 The only true hot springs in the United Kingdom are in Bath, a city in Somerset that more than any other has been shaped over two millennia by those thermal springs. Iron Age communities that settled in the hills surrounding the springs worshipped here. The Romans came and stayed, building a large bathing and ritual complex. Over the centuries since these early beginnings the very same springs have remained at the heart of continued developments in the city, creating a truly unique destination that is popular with visitors to England. A city that is itself listed as a UNESCO World Heritage Site. 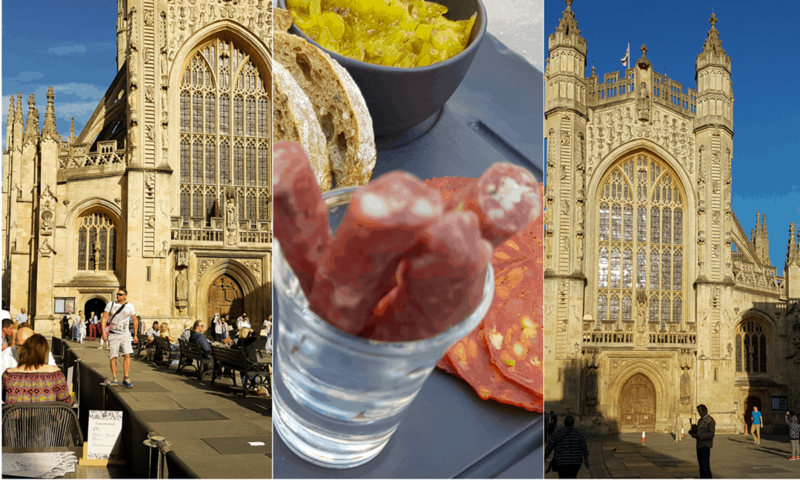 With 2,000 years of history to choose from, the following are my suggestions for the top things to do and see in Bath. A popular image of Bath, the Great Bath with the tower of Bath Abbey in the background. On a previous, somewhat fleeting visit to Bath I only saw the Roman Baths. But at the end of summer 2017 I chose to spend a bit more time exploring the city and all it has to offer culture buffs. Besides being much more aware now of what there is to see and do in the city, I was struck by how unique this place really is. There are three hot springs here, and together they are the only true thermal springs in the UK (true as in the water is hotter than 37°C). Bath is one of two cities to have been inscribed on the UNESCO List of World Heritage, the other being Venice. In 973 Edgar I, the first king of all England was crowned in Bath. Later in the 1700s it was in Bath that two men revolutionised the way letters were delivered across Britain, developing the nation’s extensive postal network. A method that has been replicated around the world. 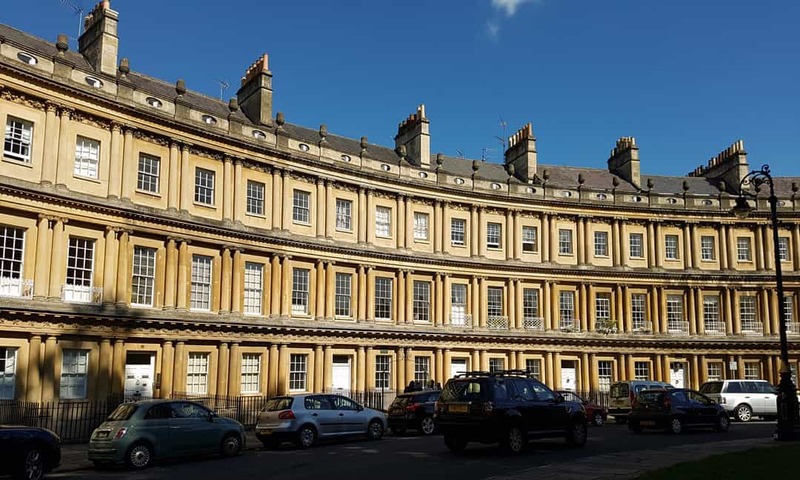 Towards the end of that same century, Bath’s iconic Royal Crescent was the first line of terraced houses to have been built as a crescent rather than a straight line. In March 1781 the astronomer William Herschel discovered the planet Uranus from his garden in Bath. And there is more, some of the museums of world cultures are unique in their own ways. 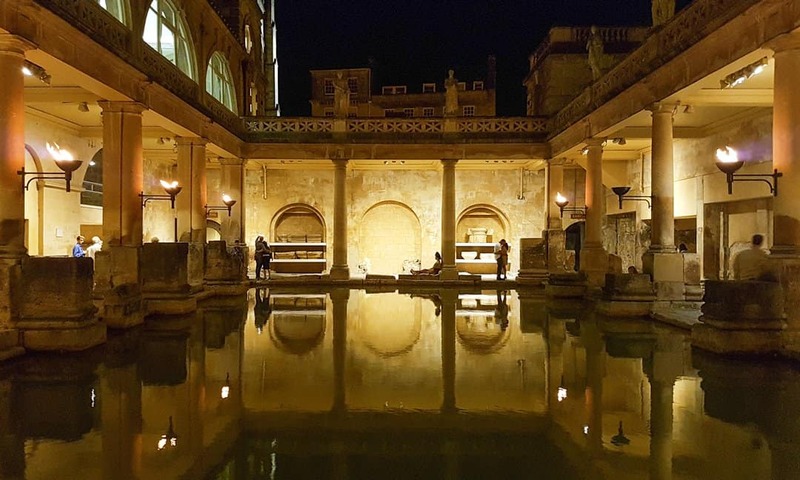 As spectacular as the Roman Baths are (they are, after all, the best preserved in northern Europe) there is just so much more to Bath – even if much of the city’s history has been shaped by the presence of the hot springs. The following is by no means a definitive guide to all that is on offer. Rather, it is a list of top ten things to do and see based on my own interests and experiences. At the heart of Bath, both physically and historically, is the strikingly evocative Victorian reconstruction of the Roman Bath and an engaging state-of-the-art museum. It should come as no surprise to anyone that this attraction is the most popular in Bath. Built by the Romans in the 1st century AD, these are the best preserved remains of a Roman bath and temple complex in northern Europe. The baths are open to the public all year round, every day except Christmas and boxing days. From mid June to the end of August the site stays open until 22.00, allowing for a quieter, more reflective visit. The Great Bath lit up in the evening for visitors during the summer months. Following the Romans, from the Saxons to the Victorians and contemporary heritage professionals the site of the thermal springs have undergone significant changes. Having visited many Roman sites in Britain, this is by far one of my favourite. The presentation of the site itself and the many wonderful objects found by antiquarians and archaeologists over the years is quite remarkable. And from my three visits (one at night and two during the day) I know I am not the only one who thinks that. This is not an attraction people rush through. When you enter, your first experience if the rather grand ticket desk in a concert hall built in 1897. You are given an audioguide, and your introduction to the baths proper starts in the covered Victorian terrace overlooking the Great Bath. With innovative use of a variety of display methods and techniques visitors get to follow the fascinating story of the bathing and ritual complex. Superbly created models show the extent of the complex, cleverly projected video animations bring ruins to life, interestingly displayed objects draw us in further to the goings on at these baths. And there are some truly exquisite objects on display. Don’t miss the case showing the Roman coins found in the spring, presented chronologically by emperor. As simple display technique that really does capture attention. Given this is a popular attraction in Bath (with over a million visitors a year), there are times when it is quite busy. The earlier or the later (last entry is an hour before closing time) you can go the better really. For that special experience of the steam rising from the waters in the Great Bath, apparently the best time of the year is February, first thing. Otherwise avoid the middle of the day, when most of the tours groups come through. For further information, see the Official Website. remains of the pediment of the temple dedicated to Sulis Minerva. Right next to the Roman Baths is one of the last great Medieval churches to have been built in England. Founded in 1499, it is in fact the third church to have been constructed on this site. Now a Parish Church, Bath Abbey tells a fascinating story about the history of the Church in England. But go beyond, or above, the ground floor with tour of the tower for spectacular views over the historic city. You will get to sit behind the clock face, some 40 metres above the ground. Looking up at the tower, 49 metres or 161 feet high. 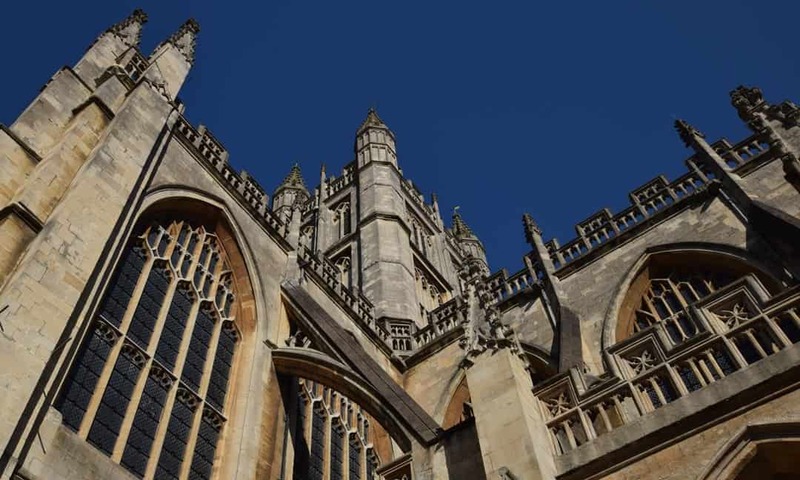 Although heavily restored in the 1860s, Bath Abbey is one of the more notable, later examples of Perpendicular Gothic architecture in the English West Country. The church is also noted for its fine fan vaulting, designed by the same brothers, Robert and William Vertue, behind similar vaulting in the Henry VII chapel at Westminster Abbey. The Abbey is free to enter and an excellent leaflet is available that points out the main features of the church. You can not help but notice the number of memorials on the floor and the walls. In all there are over 1,500 of these – the oldest for Richard Chapman who died in 1572. For a small charge (£6) you can take the Tower Tour, and even though I am slightly acrophobic this is a must. 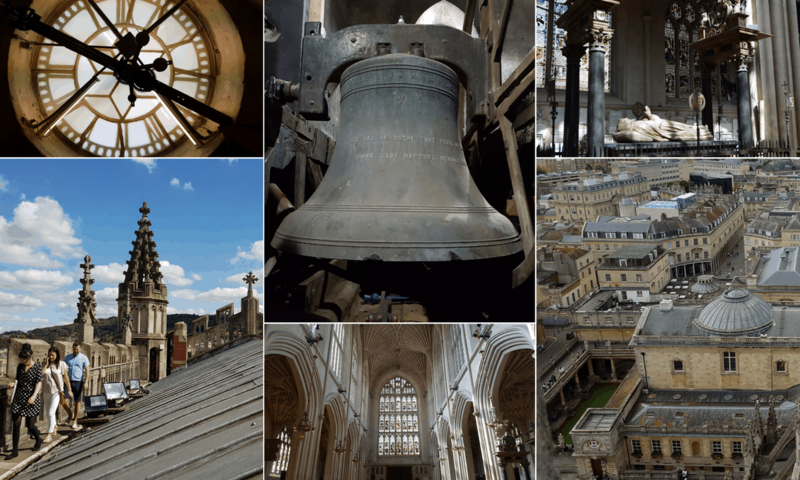 In all the climb to the top is 212 steps, but your first stop is after 120 of these for the bell ringers room and a view of the clock mechanism. Then up to the roof of the tower from where you get a great bird’s eye view of the city, looking down onto the Roman Baths and the modern, recently refurbished spa. Above: the clock mechanism behind the clock face; the tenor, the only surviving bell of the original ring of six dating to 1700; the tomb of James Montagu. Below: one of the four polygonal turret pinnacles on the tower; the east window and fan vaulted ceiling; a view of the Roman bath and modern spa from the tower. One of my favourite ways of getting an introduction to a city is to take a walking tour. A generic walking tour lasting an hour or two with a guide who is passionate about their city is a pleasurable way of finding out what that city has to offer. Then you are able to go on and explore those aspects and attractions that interest you at your own pace. Not surprisingly, Bath has a range of walking tours for you to choose from. 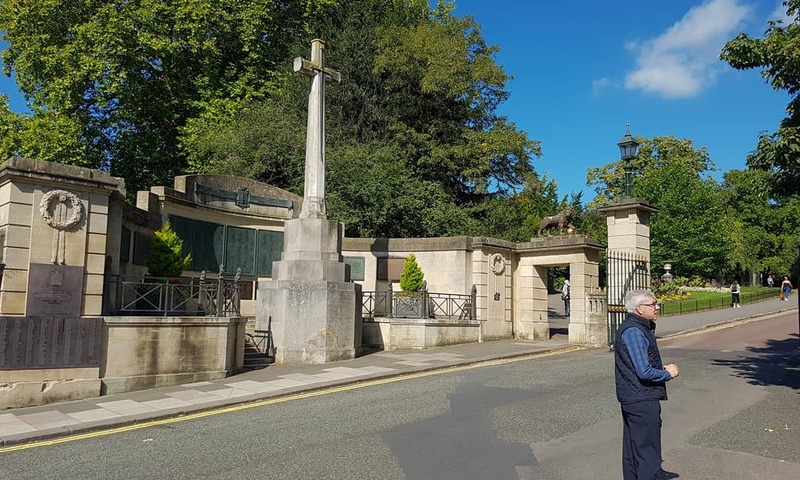 A stop on the Mayor’s Guides Walking Tour of Bath at the World War 2 memorial outside the Royal Victoria Park. My exploring started with a walking tour lead by the Mayor of Bath’s Guides (you can even follow them on Twitter and Facebook). The tours begin at the Roman Baths and follow a route for about two hours taking in the main sights of central Bath. This is the only totally free walking tour of Bath; the volunteer guides are not allowed to accept tips. As it is free, do not be surprised by the large turn out, but do not be put off either. There are some 85 Mayor’s guides, and large groups are divided into smaller more friendly groups, each taking in the same set of sights but following a different route. Our guide was very engaging and a joy to follow. If you are staying in Bath for a few days, this is an excellent way to get started. Tours start at 10.00 in the morning and 14.00 in the afternoon each day, except on Saturday when there is only a tour at 10.30 in the morning. During the months from May to August there is also the option of an evening walk at 19.00 pm. Other walking tours are available, all lasting between 90 minutes and two hours. 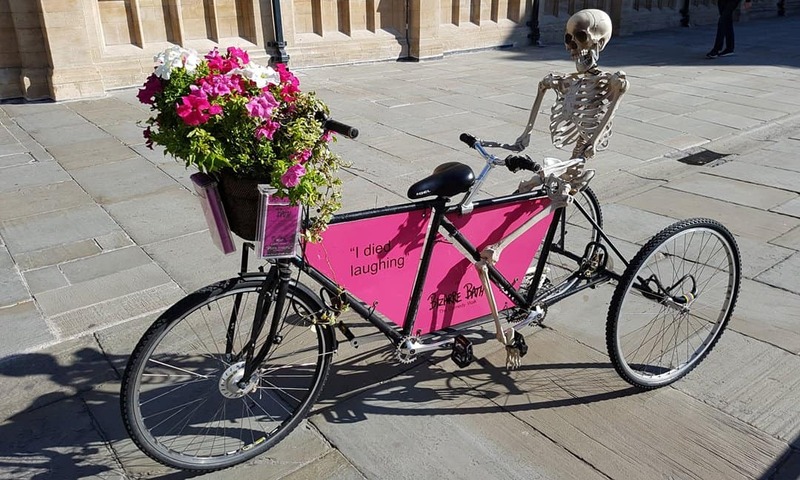 For a small fee you can take a Ghost Tour, a tour of Regency Bath, and the much praised Bizarre Bath, which advertises itself as “something hysterical rather than historical.” You will see information about these around the city, with the usual leaflets in hotels and places where people gather. For something more in depth (up to four hours) and personal, take an extended tour of Bath with a Lokafy guide. Although these tours are a bit more expensive than the small group walking tours, they are more personal, for example your guide will meet where you are staying, be it a hotel or self catering apartment. Besides the best places to visit, you will also be able to get insider tips on where to shop, where to eat, etc. … More Details and Book Online. After a thoroughly enjoyable two hours, I sat in the sun on Southgate Place with a cool drink to rest my feet for a bit and plan the rest of my time there. An advertising style in keeping with the irreverent manner of the Bizarre Bath walking tour. Many cities these days have a ‘hop-on hop-off’ bus, and Bath is no different. With so many beautiful buildings around the city, using a bus for your sightseeing is a viable and more leisurely alternative to a walking tour. On a dry day you get a great view from the top of the double-decker bus. On a soggy day, get out of the rain and see the city from the comfort of the lower, drier deck. The sightseeing bus passing by the back of Bath Abbey, a popular stop on the bus route. 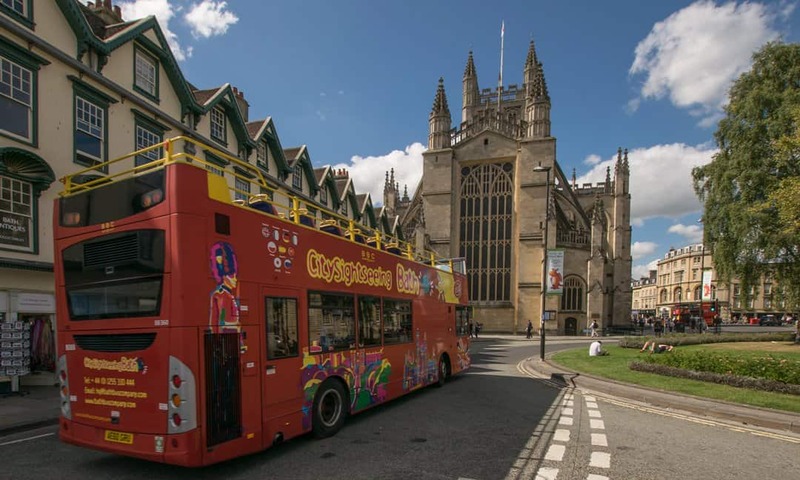 With City Sightseeing Bath buses there are two routes to choose from. 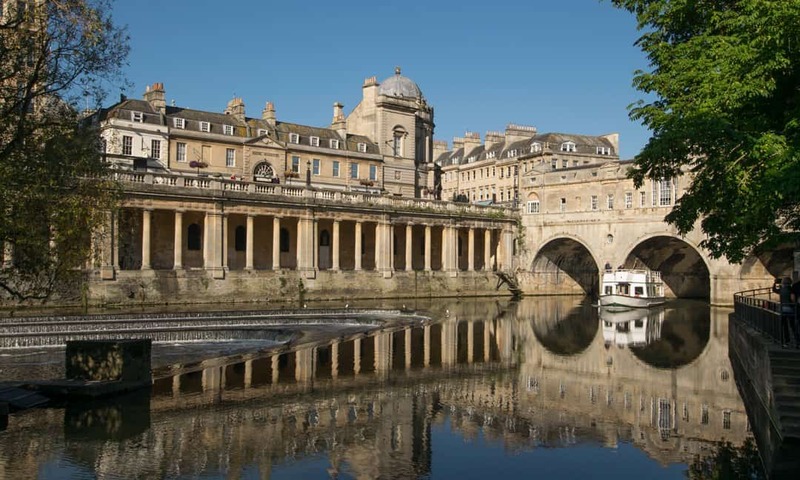 The City Tour, which lasts about 50 minutes, takes in all the major attractions in Bath, including the Roman Baths, the Pump Room, the Abbey, the Royal Crescent, the Circus and the Assembly Rooms. 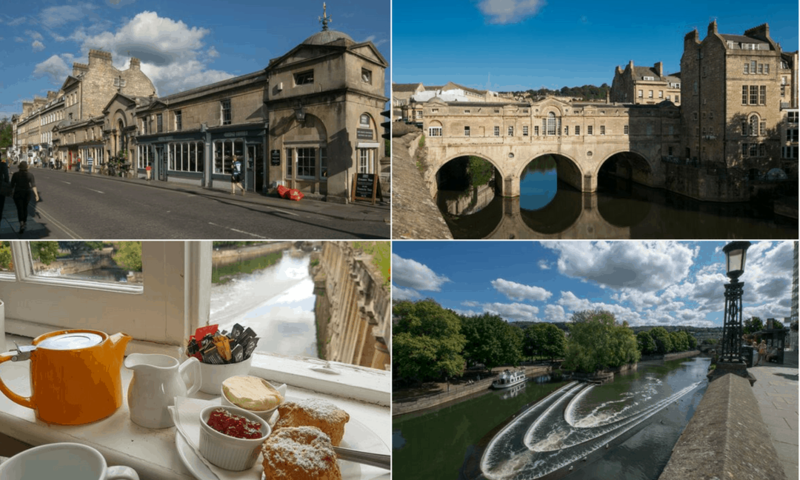 The second route, the Skyline Tour, takes in the Railway Station, Pulteney Bridge, Prior Park Landscape Gardens and the American Museum. What many people do is stay on the bus for one complete circuit to get an overview of the city. Then, they use the bus to hop-on and hop-off, stopping at the attractions they wish to visit. In all there are 38 stops, and the ticket is valid for 24 hours, i.e. two consecutive days, on both tours. And they really do run very frequently throughout the year, although with a greater frequency during the summer season. Book your bus tour online, in advance. The dramatic intensity of Baroque architecture never quite took off in England. Instead, in the Georgian period we see a style of architecture heavily influenced by the Venetian architect Andrea Palladio. Using as its base temple architecture of the ancient Greeks and Romans, Palladio emphasised balance, proportion and symmetry. Scattered throughout the city are some of the finest examples of Palladianism in Georgian architecture. All readily seen on foot or on the top deck of a bus. Terraced houses on the Circus. The ever increasing popularity of the thermal springs at the beginning of the 1700s resulted in the city expanding beyond the confines of the Medieval walls. One enterprising architect, John wood the Elder, leased tracts of lands for development. Wood designed terraces of houses, which from the street had the magnificence of palaces. Individual units were leased out for tenants to do what they wished with the interiors on the condition that the front façade conformed strictly to Wood’s design. And that design was informed by Palladianism; hence the immediate uniformity in Queen Square, the Parades, Royal Crescent and the Circus. The Circus was Wood’s final project. Apparently it was inspire the Colosseum in Rome. Instead of the balance and symmetry looking out, as it does on the amphitheatre, at the Circus the balance and symmetry is viewed from within the circle. What I found quite intriguing about the decoration of the terraced houses on the Circus is the columns. If you look carefully and you know your Classical architecture you will have noticed the different column styles. The columns on the ground floor are all Doric columns, the first floor are Ionic and the upper most floor are Corinthian. One can not help but wonder if the architect had some evolutionary developmental scheme in mind from simple to complex. Examples of Wood’s designs and influence can be seen throughout the city. 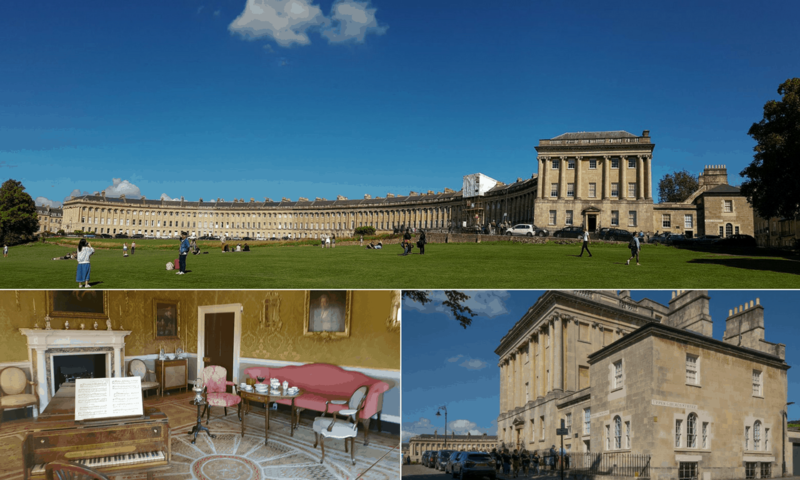 While you are at the Royal Crescent (one of seven crescents in Bath – see also Camden, Norfolk, Lansdowne, Cavendish, Widcombe, Somerset Place) get an idea of what the interior of these houses was like at No 1 Royal Crescent. Above: The Royal Crescent, the first crescent of terraced houses to be built. Below: No 1 Royal Crescent, a historic house museum, showing the ladies withdrawing room. Bath has a history of art that goes back at least 2,000 years. 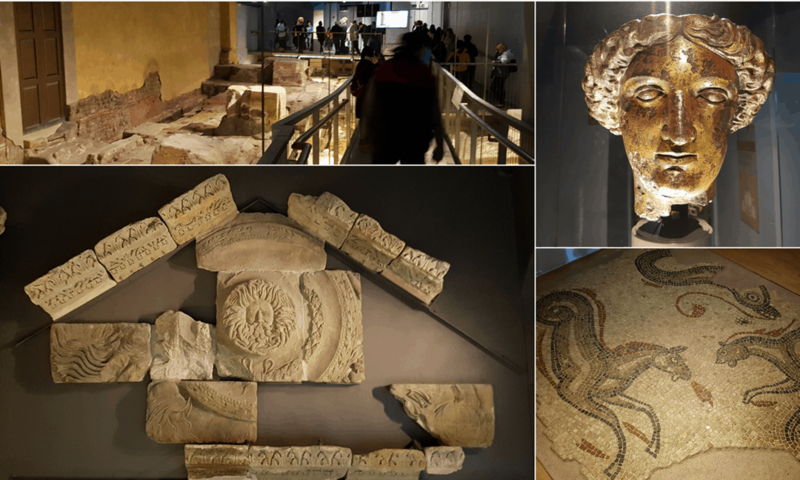 On display at the Roman Baths are some of the finest pieces of Romano-British art. Much more recently, during the late 18th century, well known portrait painters, including Thomas Gainsborough, painted the wealthier visitors to the spas of Bath. And today there are a number of galleries selling contemporary art. So if art history or purchasing fine art is your thing, Bath will not disappoint. A few example of the art on display in the Upper Gallery, Victoria Art Gallery, which traces over 500 years of art history from the late 15th century. 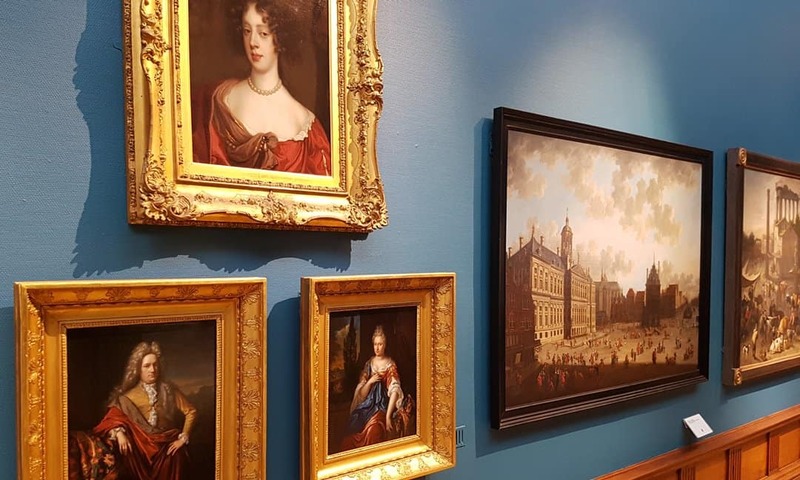 My time in Bath only allowed me to visit two art galleries: the Victoria Art Gallery, on the edge of the historic city, and the Holburne Museum, in the Sydney Gardens. Both of which I greatly enjoyed. 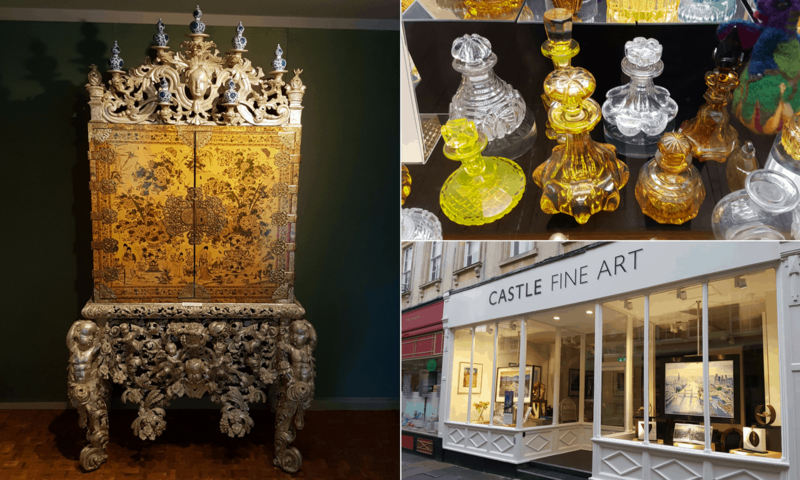 Besides an interesting permanent display of paintings from the Council’s collection that spans over 500 years, the gallery has on show over 400 pieces of decorative art, including Georgian drinking glasses, colourful Bohemian glass, and a quirky collection of pottery dogs. Exiting the museum and walking over Pulteney Bridge you can not but notice the striking Georgian façade at the end of Great Pulteney Street. That is the Holburne Museum. Intended as a grand hotel in Bathwick, the Grade 1 Listed building is now home to an extraordinary collection of fine and decorative arts. One of my favourite pieces is the lacquer cabinet, the Whitcombe Cabinet, made by English craftsmen in 1697 imitating techniques developed in Japan. This is a technique known as Japanning. But there is so much more for art lovers to see than just these two art galleries. Bath is home to the UK’s only museum dedicated to the arts of East and South East Asia; and the American Museum in Britain is the only museum of American decorative and folk art outside the United States. Left: the Witcombe Cabinet on display in the Holburne Museum – a magnificent example of an English imitation of a Japanese lacquer cabinet. Right: a colourful collection of Victorian perfume bottles, and one of the many contemporary fine art galleries in Bath. Pulteney Bridge is one of only four bridges in the world that have shops running the full length and on both sides. Originally completed in 1774, although altered several times since, it was designed in the typical Palladian style that characterises the architecture of Bath from this time. Understandably a popular stop for photographers, but I would suggest it is a great place to take a break from sightseeing and enjoy a typical English cream tea. One of the Pulteney Cruisers coming through the middle segmented arch of Pulteney Bridge. Pulteney Bridge was built to link the historic centre of Bath to the town of Bathwick, making Bathwick part of the urban area of Bath. At the end of Great Pulteney Street, about a ten minute walk from the bridge is Sydney Gardens and the Holburne Museum. Just next to the Bridge is the Victoria Art Gallery. Besides some wonderful shops on the bridge, there are a few coffee shops too – making this an ideal and picturesque location for a tea break in between galleries or other sightseeing activities. From the coffee shop on the bridge you get a wonderful view of the weir and sluice opened in 1972, installed as part of a flood protection scheme on the Avon River. (At the end of the 1700s the bridge was damaged by the river flooding.) A coffee shop on the east side of the river gets you great views of the bridge. I opted for tea on the bridge. Pulteney Weir built in the early 1970s as part of a flood protection scheme; cream tea in The Bridge Coffee Shop. Jane Austen visited Bath twice, for six weeks and two months in 1797 and 1799 respectively, before moving to the city in 1801 with her parents for a period of five years. Although it its obvious Austen spent much more of her life elsewhere, Bath greatly influenced her novels for many years after she left. The building that houses the Jane Austen Centre is not directly associated with the author (she must have walked passed it often enough) it does, however, have an excellent exhibition on Jane Austen in Bath, also providing details for those who wish to visit the various locations themselves. Part of the Jane in Bath exhibition at the Jane Austen Centre. 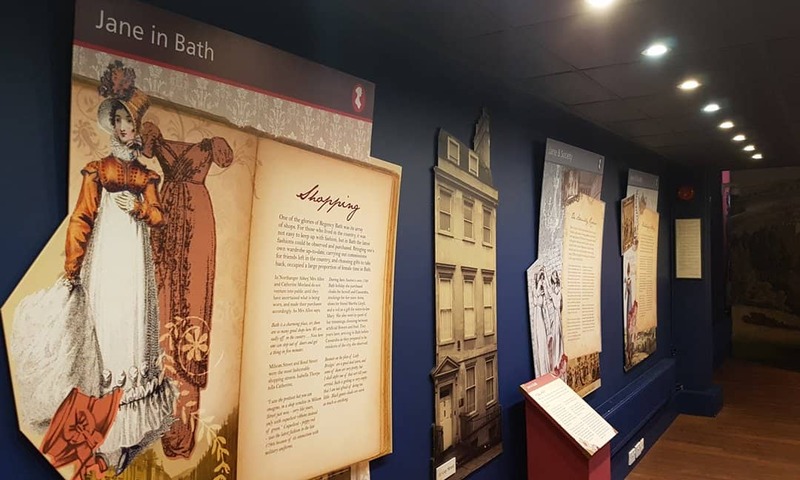 For anyone with an interest in the history and authors of English literature generally or Jane Austen more specifically, Bath will not disappoint. Although there is debate on how happy she was while she lived in between 1801 and 1805, there is no doubt that the city had a great impact on her writing. During her first visit, she came up with the plot for the novel Northanger Abbey, originally called Susan. And it is thought she completed the novel during her second stay in Bath, at 13 Queens Square. 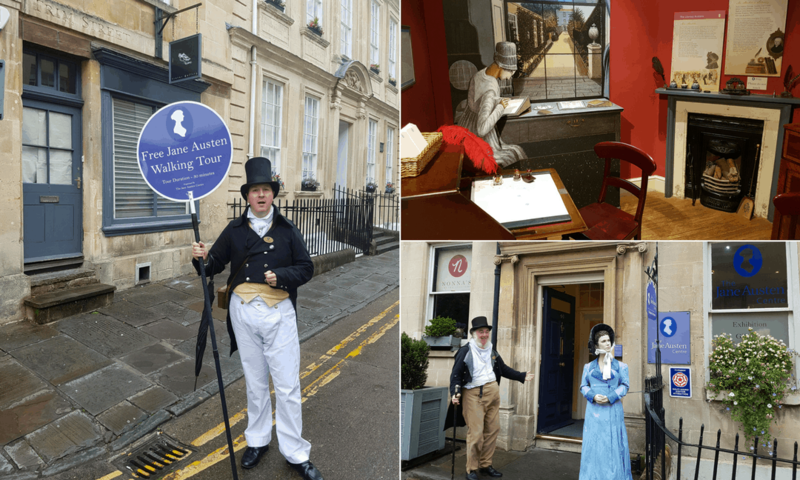 Free walking tours of Jane Austen’s Bath are provided by the Jane Austen Centre. They start at the Visit Bath office on Kingston Parade, and follow a short 30 minute route ending at the centre. The focus of the exhibition at the the centre is on the author’s five years living and socialising on Bath. On display is a lot of information about the locations that were an inspiration for her writing, with quotations from her novels and letters. The extensive and interesting text used in the exhibition was written by Maggie Lane, author of Jane Austen and Regency Bath, and other books about the writer. A more substantial, 90 minute Bespoke Guided Walking Tour of Regency Bath can be reserved in advance. And for something truly different, why not have Afternoon Tea with Mr. Darcy. Left: the tour guide in Trim Street, one of the streets in which Jane lived when her family was down on their luck. Right: inside and outside the Jane Austen Centre. Bath has many wonderful green spaces, parks and squares. But take a short stroll from the city centre and you will feel out of the city entirely. The Kennet and Avon Canal footpath is a few hundred metres behind the Holburne Museum. And a little further out and you are in the ancient woodlands on the hills that surround Bath in which the National Trust have a specifically demarcated skyline walk. After tea with a friend on the Pulteney Bridge I though a walk along the canal was required. A circular, two mile riverside trail linked to the city centre provides a different perspective on Bath’s history. Of course you can just walk along the path and enjoy the different scenery. Or you can download a map and audio guides about the history of the canal from the Canal & River Trust’s Website. On my last day in Bath it was raining so I did not get the opportunity to do the Skyline Walk. I had hoped to as I wanted to see the intriguing and aptly named Sham Castle. As the name implies Sham Castle is not a castle at all. It is a typical folly, constructed in the mid 18th century for Ralph Allen to improve the view from his house in Bath. A screen wall with a central pointed arched entrance is flanked by two three storey circular turrets. At each end of the wall is a two storey square tower. Although the folly is now on a private golf course, access is possible via Golf Course Road and the Skyline walking trail. The moderate trail through natural woodlands above Bath starts on Bathwick Hill, just above Sydney Gardens. At about 6 miles (just under 10 kilometres) it takes around 4 hours to complete. And by all accounts gives quite spectacular views of the city throughout the year. See the National Trust website for further details including a route map of the Skyline Walk. When the shadows lengthen, but it is too early for supper (there really are so many wonderful and varied restaurants in Bath to choose from) I suggest heading to the square in front of the Abbey and the entrance to the Roman Baths. 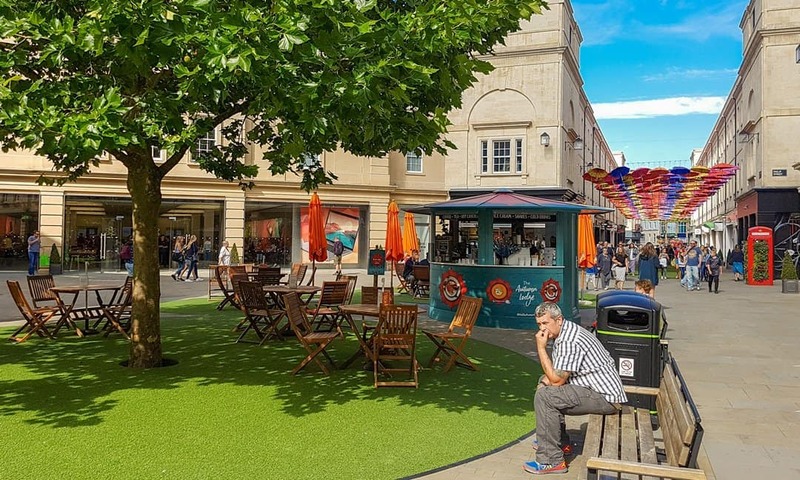 In front of two of the most iconic sights in Bath, this is one of the two places where you can be entertained by buskers while enjoying a cocktail and a snack in the Roman Baths Kitchen. Sundowners: cocktails and buskers in front of Bath Abbey. While enjoying a G&T and a mixed charcuterie platter I listened to a great violinist, and Australian opera singer and an American guitar player. Buskers also have a dedicated space a few metres away on Kinsgton Parade. This is the square formed between the south side of Abbey, the Roman Baths and Bath’s main tourist office. Benches form an entertainment space and buskers provide about 30 minutes minutes each of their talents. Yes, I spent 3 happy years in Bath on conservation projects. 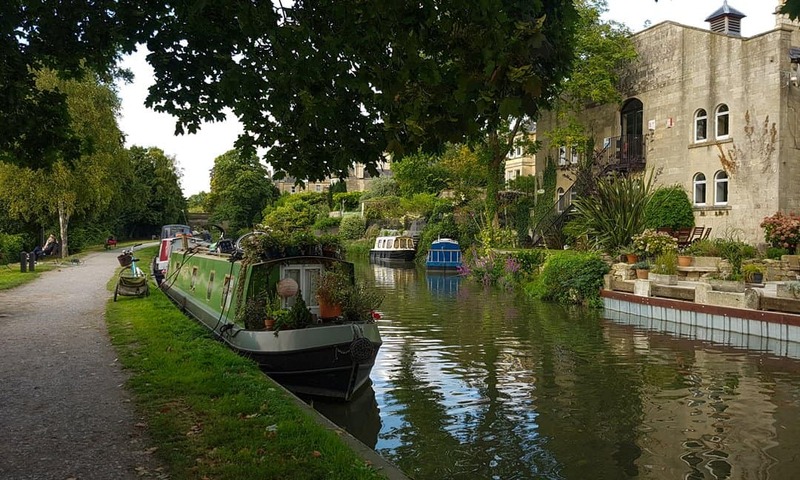 Don’t overlook the Avon and Kennet canal which linked the Bath and Bristol with London. I agree Charles, its a wonderful path through the city – and the link mentioned in the text takes you to a great website with a downloadable audio-guide.